The first time I saw Chicco Echo umbrella stroller I was at the park with my daughter Sophia and one of the moms had her son in it. My first impression was what a cool modern looking stroller! I absolutely loved the bright fresh color (it was turquoise) of the seat and the frame. I think that the combination of the black and color frame together with the black handle bars give it a very sleek and stylish look. Have you noticed that more and more companies have been doing color frames lately? I think it’s a new hot thing. Of course I had to come over, meet the mom and take a look at the stroller up close. The Chicco Echo is a lightweight umbrella stroller that is very basic, but is very affordable. It retails for only $99 which makes it perfect for traveling. Let’s say you are going to visit your relatives in another state and you want something lightweight and compact that you can take with you on the plane and later on to the restaurant, shopping or park, but you don’t want to spend a lot of money, Chicco Echo would be a good choice. Also, if it gets damaged at the airport (which happens a lot when you check it in), you are not going to be too upset because you only spend $99. Aside from a great price, it has a nice roomy seat with plenty of headroom, adjustable leg rest, tall handle bars, and medium size basket. I gave it only 3.5 out of 5 stars because although it has a very sleek and modern look, the canopy is small without a peekaboo window, there is very light padding on the back of the seat, it does not have a flat recline, and it weighs 17 lbs which is a little heavy for such a basic stroller. But the most disappointing feature were the small plastic wheels that you can use only on a flat surface. I found it hard to push with a 2.5 year old in the seat and a small diaper bag in the basket even on a flat surface. So, maneuverability is pretty bad in my opinion. What good is the price of only $99! To save you a lot of headache and frustration, I would recommend adding $40 and getting Chicco Liteway Umbrella stroller for $139. It has much better wheels, more features, and weighs also 17 lbs. Liteway should last you much longer than Echo. -Small canopy. The canopy is on the smaller side and there is no peekaboo window. You can unzips the back of the canopy to provide your child with better air circulation on a hot summer day. It does not have the “follow-the-sun” option either. Overall, the canopy is a disappointment. I wish it had a pop-out sunvisor. -Tall handlebars. The handlebars are located 42″ from the ground which is very tall. Great for tall parents! They are organically positioned and are covered with black foam for comfortable grip. -Roomy seat. The seat is pretty roomy with plenty of headroom for an older child. It is 12.5″ wide with 18″ seat back and a measurement of 26″ from the bottom of the seat to the top of the canopy. Unfortunately the back of the seat is very lightly padded so your child might not be very comfortable seating in it for a long time. You can even feel the support bar through the material. I was a little disappointed about that. BTW, the bottom of the seat has enough padding for comfort. The seat has one-hand lever recline with four positions. It’s a deep recline, but it does NOT go all the way to a flat position so you can’t put your newborn in it. It is suitable for kids from 6 months and up to 40 lbs. Because many umbrella stroller don’t have a recline at all, I was happy to see a deep recline. It’s deep enough for a nap or a diaper change. I like that there is a piece of fabric at the top of the seat back that will prevent a younger child from falling out of the stroller (which is a very unlikely anyways, but stuff$&% happens). For those parents who want a very upright seat, this one is at a slight angle even in the most upright position. -5 point harness. There is an adjustable padded 5 point harness with a tricky buckle so your child will not be able to escape. -Adjustable leg rest. There is an adjustable leg rest that goes up or down. There is also a leg rest attached to the frame for an older child. -Double wheels. It rolls on four small plastic double wheels that are only 6″ in diameter. These wheels are designed for flat surfaces ONLY! They are not going to tackle terrain at all. I also found it hard to push with an older child in the seat. It is easy to maneuver only if you have a younger child in the stroller and you are on a completely flat surface. This would be a good stroller to take with you on the plane, quick trip to the mall or a cafe, or to a doctors office. It’s hard to tell how long these wheels will last, but I don’t think it’s many years and multiple kids kind of a stroller. Front wheels are swivel, but could be locked straight. -Front-wheel suspension. It’s looks like Chicco tried to make the ride a little smoother by adding the suspension. -Parking brakes. The rear wheels have individual brakes that you can step on to lock in place the wheel. They are NOT flip-flop friendly. -Medium size basket. It has a pretty decent basket for an umbrella stroller. You an probably fit a small diaper bag in it, but nothing more. The basket is easily accessible from the back and the sides. Because of the crossbar in the back it is hard to get into it once the seat is fully reclined. Typical for an umbrella model. -Easy fold. It folds like most umbrella strollers into a neat compact package. It has an automatic lock. -Cup holder. INCLUDED! The removable cup holder is included. Unfortunately it kept falling off every time I would fold the stroller. Very easy to lose it. -Weight. I know it weighs only 17 lbs, but for the features you are getting, I think it could be a little lighter. -Small canopy. The canopy is small, does not have a peekaboo window and does not have a “follow-the-sun” option. A simple addition of a pop-out sunvisor could be an easy fix. -Small plastic wheels. By far the biggest minus of this stroller! 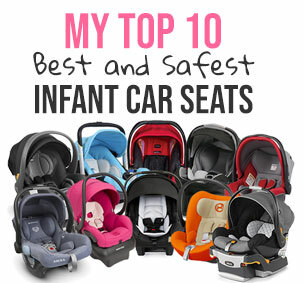 They are small and plastic which makes it very hard to maneuver on uneven surface or even on flat surface if you have an older child in the seat. Here is an overview video from BabyGizmo. As always, Hollie is very positive about the stroller. Way more positive than me. LOL. Chicco provides 1-year warranty from the original date of purchase and you have to be the original owner. Unfortunately, I was not able to find official warranty page on their site. 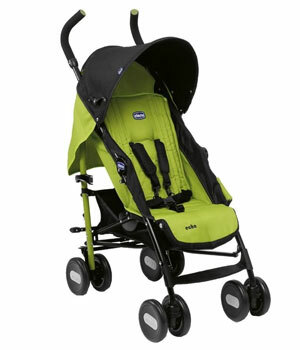 This stroller is available in 6 colors: turquoise, amber, coal, cyclamen, jade, dragonfruit. It comes with a combination of a black and color frame. Love the Turquoise color! If you want to see how Echo model compares to other Chicco strollers here is a great comparison chart. My favorite place to buy strollers and a lot of other baby items is Amazon. It usually has the lowest prices, free shipping, free returns and no sales tax. How great is that? You can get Chicco Echo in one of the six beautiful colors for around $99 on Amazon (free shipping/free return and no sales tax). It comes with a cup holder and a boot cover.